To the north of Emerson on the west bank of the Red River lies Fort Dufferin. Today few know of it, but in 1872 it was the Canadian headquarters of the International Boundary Commission set up to mark the 49th parallel of latitude, the dividing line between Canada and the United States. On July 8, 1874, Fort Dufferin was a gay and busy place. Bugles were blowing, oxen bellowing and Red River carts squeaking. This was the day of the "march out" when the new force of the North-West Mounted Police was to start for the foothills of the Rockies to establish law and order in 300,000 square miles of territory inhabited only by Indians and a few traders and missionaries. The march out that day was to be a "Hudson's Bay pull out" to shake down the expedition and to see if anything was missing, but it was also to be the start of the longest march of any military force carrying its own provisions. Less than ten months before, the Canadian government had passed a bill to establish the North-West Mounted Police. Three squadrons, or 150 men and officers, spent the winter at Lower Fort Garry. 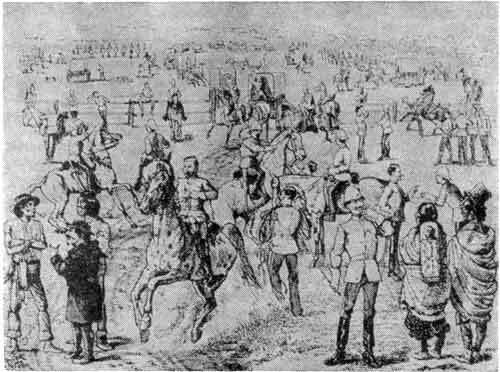 Three additional squadrons trained at Toronto and the two groups met at Fort Dufferin on June 19, 1874. 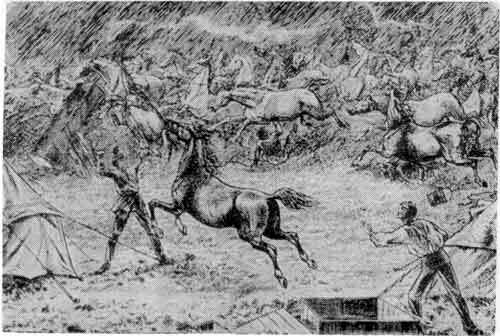 That evening there was a terrific thunderstorm and a bolt fell among the eastern horses. Maddened, they tore their fastenings, overturned the circle of waggons and dashed across the prairie until exhausted. Within a few days however, all were brought back. Because little or no food could be had in the thousand miles to the Rockies, provisions for six months had to be carried, cattle driven and grass cut. So the expedition included 142 oxen to pull the 114 Red River carts with their 20 Metis drivers, 73 waggons, mowing machines, a forge, field kitchens, 2 field guns and 2 brass mortars. The guide and interpreter was Pierre Leveille, who stood over six feet in his moccasins and weighed 300 pounds. The squadrons were named A to F. "A" squadron had dark bay horses, "B" dark brown, "C" bright chestnut, "D" greys and buckskins, "E" black and "F" light bays. The men wore scarlet tunics, grey or flesh-colored riding breeches, long boots, white helmets and gauntlets and brown leather cartridge belts. A special group carried lances to impress the Indians. To the Indians, the scarlet uniform meant courage and fair play. By July 8 everything was in readiness and towards evening the order to march was given. Three miles to the west along the boundary trail the force halted by a little lake, so that before the next sunrise it might be on its way in earnest. "The record of this distinctively Canadian force in policing the plains is a source of pride to the people of Canada." * To reach the site of old Fort Dufferin anyone travelling north on highway 75 from the international boundary, would turn right on the old highway just after passing over the bridge across the Red River at Emerson.